A simple framed opening dimension is the only building detail you need for a Higher Power Door. Every door is carefully manufactured to fit into a precise clear opening. Our hangar door is ideal for retrofitting existing buildings. Unlike Bi-fold doors and other hydraulic doors that require an expensive framed opening that is part of your building cost. A Higher Power Door requires nothing more than a common framed opening - and that is saving you hundreds if not thousands of dollars. 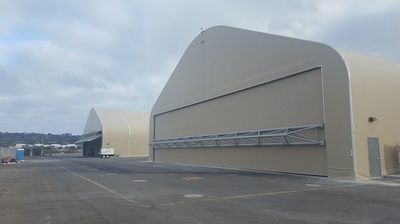 Whether you design your building for small aircraft storage or as a large commercial aircraft hangar, our doors will fit your building as if they were part of the original design. You need to ensure the security of your hangar or storage building, but you also want fast and easy access. We build Higher Power Doors with that in mind. These hangar doors are completely self supporting. There are no vertical or horizontal loads to stress your building where bi-fold or conventional one-piece hydraulic doors do. 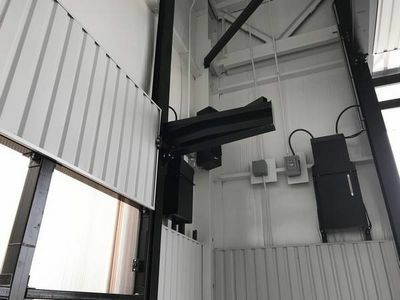 Our patented cam and roller technology glides and rotates the door open making sure your hangar door rides smooth at an unbeaten 24-40 seconds open/close speed.